My artistic career as a balloon twister and decorator began in 2003 at the Euro Jam. After participating in a couple of workshops, I passed the QBN test in 2010. Ever since then I have shared my knowledge as a teacher in various twisting and decorating workshops. In November 2013 I decided to start the Balloon Jam Hamburg. Besides the balloons, I am also the owner of an event-planning agency.I am a clown, children’s magician, dj and do voluntary work at two schools. She is working as a twister since 2012 and supports the jam with words and deeds. Essential are her English skills for the jam. Sandra translated the homepage of the Balloon Jam Hamburg and translates conversations of English-speaking twisters and teachers. Thank you for that. Biggi and Mark not only are the sponsors (of a part of the balloons) for the Balloon Jam Hamburg but also became good friends over the years. I am sure many of you feel the same way. They will have a sales booth with their team and advise us regarding everything balloon-related. Because they have a heart for us artists, they offer a jam-discount for their products. 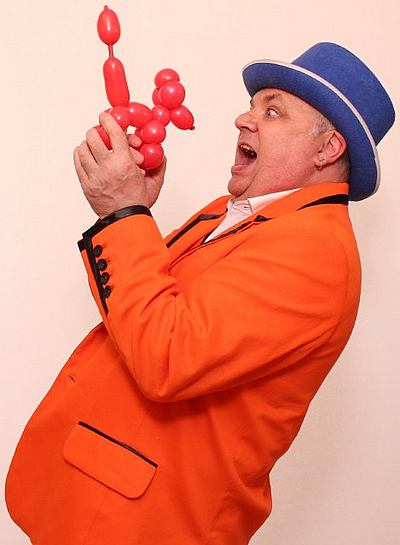 Tom is a versatile artist who is not only a balloon twister and decorator, a juggler and stilt walker; he is also an excellent and entertaining host for any kind of show. He organizes the show program, guides through the show and entertains us with his wit and skill. I was able to win Kerstin and Mohammed for the Jam Bar in Hamburg. Well-liked by everyone, they are a strong team that leaves nothing to be desired. The bar will be opened day and night around the clock. We were able to get Verena Bockholt, Jaani Hintikainen und Steven Atkinson as helpers for all the incoming work at the jam. They are going to clean up the workshop rooms, fill up the balloon boxes in the jam hall, rearrange rooms for different purposes and help us everywhere where help is needed.